3 "The Van Jones Effect: Right Wing Frenzy, Inside/Out Strategies and Red Scare"
Terry Marshall is a Boston activist. He has been involved in youth and social justice struggles for over 15 years and founded Intelligent Mischief in 2013. 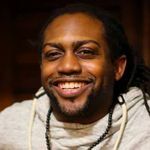 In 2008 Terry became the Lead Youth Organizer of the Healthcare Education Project, an initiative of 1199 SEIU in New York City. While there he led the innovative “Young Voices For Healthcare” campaign to involve young people in the healthcare reform struggle. He was is the Lead Youth Organizer for the Healthcare Education Project (1199SEIU), a Blogger for octavianprinciple.wordpress.com and enjoys being a heretic of the Left. Terry Marshall, Hip-Hop Media Lab, Hip-Hop Sustains, was in Students Organizing for Unity and Liberation (SOUL) at Roxbury Community College in Boston in the 90s. "Green Deen: What Islam Teaches about Protecting the Planet", was written by Ibrahim Abdul-Matin, Keith Ellison. Those thankedd for their help included Terry Marshall, Maytha Alhassen, Tanjila Islam, Najima Nazyat, Yusef Ramalize, Taj James, Jungwon Kim, Suyoung Kim, Wahija Akhtar, Awais Khaleel, Anas Canon, Bracken Hendricks, Mahea & Alea, Kizzy Charles-Guzman, Marianne Manilov, Zaid Mohiuddin, Jody Tonita, Ferentz Lafargue, CAIR-NY, the Green For All Fellows, and the 2008 National Urban Fellows. "The Van Jones Effect: Right Wing Frenzy, Inside/Out Strategies and Red Scare"
"The Van Jones Effect: Right Wing Frenzy, Inside/Out Strategies and Red Scare" Wednesday, 16 September 2009, 19:30 The Brecht Forum. Jed Brandt, Rosa Clemente, Harmony Goldberg, Arun Gupta, Randy Jackson, Jee Kim, Terry Marshall, Lenina Nadal. The anti-communist screed launched by Glenn Beck forced forced Van Jones to resign as advisor to President Obama. While Beck’s media maelstrom is reminiscent of the 1950s “Red Scare,” it also reveals the deep fissures in American society. The country is facing off in terms of race and class, with Obama playing the Janus head to both the progressive forces that put him in office and a reinvigorated right. In the background is the very real possibly (and dare say, hope) of a rising radical force that can push Obama to the left and reshape domestic and foreign policy. Tonight’s activist panel looks at the ways in which the Van Jones effect opens up crucial questions to radical left forces How do radical left forces interact and relate to this administration? How do we push on critical issues like health care? How did the right wing capture momentum? How does the left get its groove back? Those saying they would attend, on Facebook included Terry Marshall. This page was last modified on 9 April 2018, at 12:17.